There isn't a magical formula for how to organize tools the right way. On the contrary, organizing tools can be a very individual thing. In many cases, placement depends on function. Are you a woodworker, a home renovator, a weekend warrior? Each skillset comes with different considerations and a different set of tools. A woodworker might need more small tool storage whereas a home renovator might need an easily accessible place to organize their power tools. However, there are some basic tools that most homeowners need to store, and there are several clever ways to get the job done. These tool organization ideas and tips will help you figure out more effective ways you can clean up your workshop. The first step to organizing tools is to do a thorough inventory. Once you have a general idea of the tools on hand, sort them into like categories. Group all the power tools together, sort through small hand tools, and so on. Next, create zones and use cabinetry to keep like items together. For instance, here's a DIY storage cabinet designated for tablesaw equipment. When planning a workshop layout, this cabinet would be hung in close proximity to the tablesaw. Details like this might seem trivial at first, but they will enhance the ergonomics in a space where it's often overlooked. 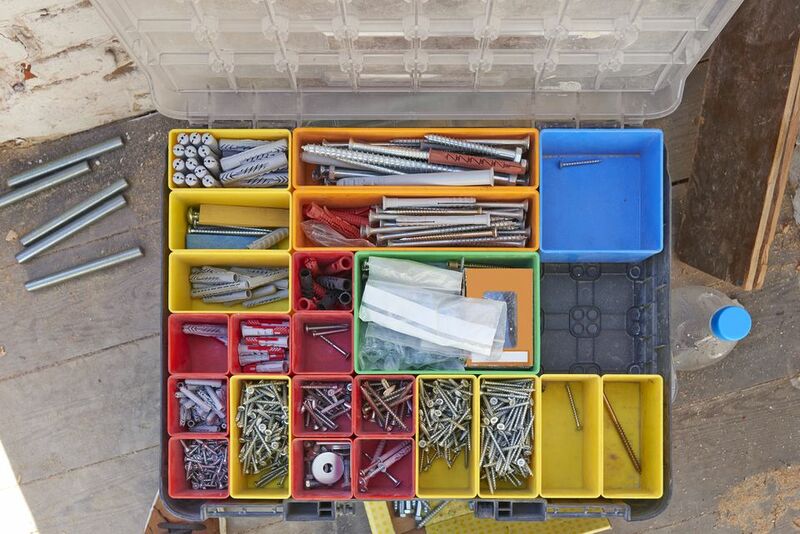 The best way to organize tools is to customize storage pieces to fit the space. For instance, purchasing a workbench is not nearly as effective as building one with specific storage spots for the tools you currently own. Building a tool cabinet is a smart way to maximize any vertical space you have to spare. Use pegboard as a backing and on the cabinet doors so that you have plenty of surface area to hang tools. One common trend you'll see in basements and workshops is the move toward more open-concept storage. Instead of storing tools and essentials inside cabinets, many homeowners are opting to keep these items out in the open. If you have a blank wall, install a large slat wall system similar to what you might see in a retail store. You can use hooks to hang tools, but consider storing like-items inside bins and transparent plastic containers. You'll be able to pack more items into each square foot that way. Again, one of the most effective ways to keep a work surface clear is by having ample vertical storage space. Tools hidden away in tool boxes and drawers can and will be forgotten about or misplaced. The more you can visually see on the walls, the better. 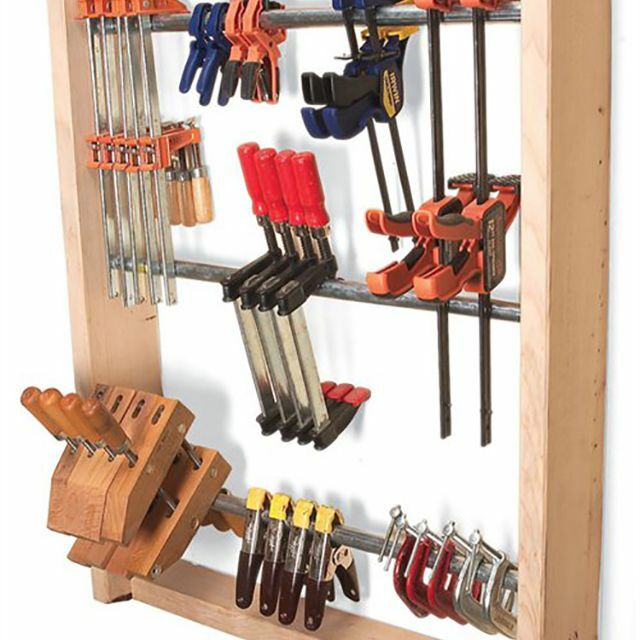 There are many ways to hang tools on a wall including, like slat boards and pegboards. Another popular option is to use vertical strips and anchor hooks on the strip. For smaller tools, consider a magnetic strip. Many people struggle with how to organize power tools that they use often, especially when they are in the midst of a big project. If you are in the process of renovating a home and find yourself struggling to keep your tools in order, consider adding a mobile workbench into the mix. The plans for this workbench include ample hanging storage for power tools and space for storing larger tools like air compressors. Try to build-in as much storage as possible so the top remains a clear work surface. The end of a cabinet or workbench is an ideal spot to add extra tool storage. Before you go out and buy wood for this project, see if you have any scrap pieces you can use instead. Remember, this location is ideal for commonly used tools like screw drivers if it is close to your work area. If the open cabinet space is on the other end of the work shop, you might consider storing something else that you won't reach for as often in that location. Some tools don't make sense on a pegboard wall or maybe they just won't fit given the space. Organize items like paint rollers and tubes of chalk inside clear plastic totes and store the totes on an open shelving unit. Even though the totes are see-through, it is helpful to spend time labeling each container. This step will make it much more likely that you and other family members will put the tools back where they belong when they're done using them. Some workers like to save every spare screw and some don't. If you are one of the former, make sure you have a system in place for sorting through all these miscellaneous items. Clear jars work well for organizing small parts, but you need to be able to put those jars somewhere that won't clog up counter space. Build open shelves for them to sit on. You can even screw the lids on the underside of a shelf and screw the jars in that way. Cordless power tools are wonderful so long as you don't lose track of your batteries and chargers. Build a custom charging station for your most used power tools and make sure you add an outlet so the storage space is functional. This wall unit works well for a small collection of power tools, but you may require something more substantial if you own significantly more cordless tools than this. Not everyone wants their tools out in the open. Why? There is the risk of theft when expensive tools are visible in a garage or shed that people can see inside. If this is the case, store tools inside cabinetry that can be locked. However, don't just toss your tools inside the cabinet and call it a day. Keep them organized by hanging them on the walls. To complete this project, simply line the interior walls in a cabinet with pegboard.